There are so many different options for romantic gestures just waiting to be experienced this year. With the new year having just started, it’s also time to set a resolution to ignite that flame in your relationship. Surprise your partner with a quick, spur-of-the-moment getaway! Throughout the work week we find ourselves in a routine, it is great to have steady hours, pay cheques and a schedule. But sometimes we just need to throw away the 9-5 and unwind. Harrison is the perfect spot to escape and find time to really enjoy each others company. Before it is too late you should really go for a well lit romantic night stroll, hand in hand, holding each other to stay warm. During the winter months, grab a warm apple cider or a cup of steaming hot chocolate, sip and stroll down the boardwalk. 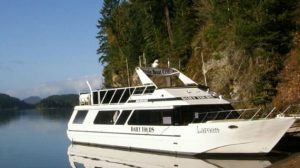 From February 15-April 15 you can book a waterfall cruise with Shoreline Tours which is a 2.5 hour scenic experience. You pass around a small island and dock on the shore that seems to be in the middle of nowhere. After a short 5 minute walk you will find yourself gazing upon the glorious Rainbow Falls. They are 2,700 food tall and will mist you a little bit but one a a warm spring day it will be very refreshing. After basking in it’s glory you can hop back on the cruise which offers food and drink services. The magic is all in the name, Harrison Hot Springs. Time to grab those bathing suits that have been sitting in storage for the past few months and experience the next level of relaxation. 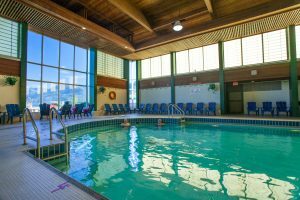 The Harrison public hot springs pools are just a moments walk away from our hotel and the perfect place to relieve stress and reconnect with your partner. Harrison Beach Hotel offers packages specifically for those couples looking to for some much needed time together. Both options set you up with a convenient complimentary parking space, a bottle of fine wine upon arrival, and late check out for those late nights. 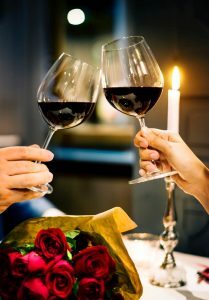 Romance at Dusk is geared towards the pair made for the night which includes a dinner at Morgan’s Bistro or the Black Forest Restaurant. Romance at Dawn is for the early risers that want to start their day off right with a breakfast at Suzy’s Café or Harrison Corner Café. The choice is yours, but one thing is for sure, every couple should experience a stay in Harrison at any stage in their relationship. Celebrate a birthday, anniversary or your honeymoon here, Harrison is the perfect place to take your partner and remind each other why you are so madly in love. Reserve today!